On faith, economics and politics, it is futile to persuade people to change their opinion. This is because to varying degrees, these opinions are based on beliefs. But we can discuss people’s assertions on economics putting them in context so that readers can come to their own conclusions. So, while I am not trying to persuade Mr. Koul to change his opinions, I do put his observations on the US economy under Donald Trump’s first year in the White House in the context of Obama’s eight-year presidency. 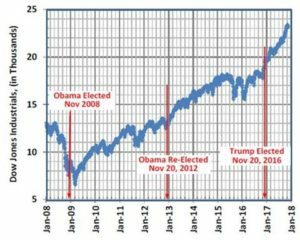 Mr Koul’s assertion on the Dow Jones’ new peaks during Trump’s first year is correct if you take the one year of Trump’s residency in isolation. But when you look at the D-J numbers since Obama’s time, we can place the D-J numbers under Trump in context. See the plot below. When Obama won the election in 2008, the D-J average was around 9000. During his presidency, it steadily rose from 9000 to almost 19,000 in the long-haul, with a few inevitable short-term hiccups. In Trump’s first year, this trend only continued. 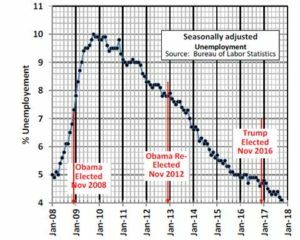 On unemployment: Again, Mr. Koul’s numbers are correct if you take Trump’s first year in isolation. But here is the trend on unemployment in the last nine years. Plot below. When Obama was elected, unemployment was over 7%, and went up to 10% in his first year. Then, it continuously dropped from 10% in January 2010 to 4.8% when Obama’s presidency ended in November 2016. Even a die-hard Republican would agree that an eight year trend of a steady drop in unemployment is significant for any president. 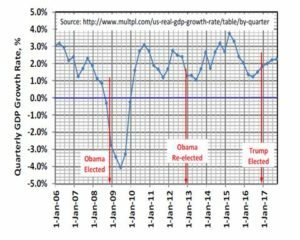 During George Bush’s last three years in office, the GDP growth rate fell from 3% in Jan 2006 to negative growth (-2.8%) by the time Obama was elected. In Obama’s first year, it hit a low of -4%. But since 2010, GDP growth has been in positive territory. For four quarters under Obama, the GDP grew at over 3%; and well above 2% for over 4 years in his 8 years in office. Under Trump’s first year in the White House, this trend continues. To summarize, Mr. Koul’s claims on the D-J numbers, unemployment and GDP growth numbers during Trump’s first year in office are correct — and also quite noteworthy — only if you consider the Trump presidency’s first year in isolation. However, if you consider Trump’s first year in office in the context of Obama’s earlier eight years in office, the numbers and trends under President Trump are a continuation of the trend set by the Obama presidency. Good for President Trump. And good for the citizens of the USA. This entry was posted on January 6, 2018, 9:42 am and is filed under January 2018, Past issues. You can follow any responses to this entry through RSS 2.0. You can skip to the end and leave a response. Pinging is currently not allowed.